Would you like to explore the beaches of Barbados and swim in the crystal blue water among the coral reefs? The winner of Bgo’s new raffle will get to experience pure luxury at a 5-star hotel in a real luxurious Caribbean paradise, so if you’re longing for the sun this is a promotion you shouldn’t miss out on! Bgo is going big with their latest raffle. Tons of cash prizes, fair spins and an exclusive holiday will be handed out to 20 winners and by playing games from the famous Rainbow Riches series you can get your hands on one of the prizes. The draw takes place on Monday 2nd of April, so now is the time to join in on the fun and playing some classic slots from Barcrest! The rules are simple: play any of the games in the Rainbow Riches series to gather tickets into the raffle. One ticket will be added to your account for every £10 you wager on any of these games: Rainbow Riches, Rainbow Riches Freespins, Rainbow Riches Leapin Leprechauns, Rainbow Riches Pick n Mix or Rainbow Riches RoG. If you want to turbo boost your ticket count, you can play the brand new Rainbow Riches Fortune Favours slot to double the amount of tickets you get - instead of just 1, you’ll get 2 tickets for every £10 you play on this game. 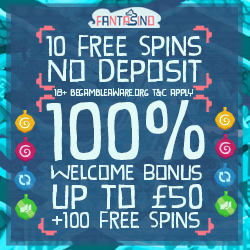 The fair spins will be credited on a range of great games such as Hotline, Wild Wild West and Finn and the Swirly Spin and as always they come without any wagering requirements or confusing bonus terms and conditions. Dig out last year’s sun cream and cross your fingers that you get to spend a week in paradise! Check out the raffle terms and conditions on the promotion page at Bgo before participating.